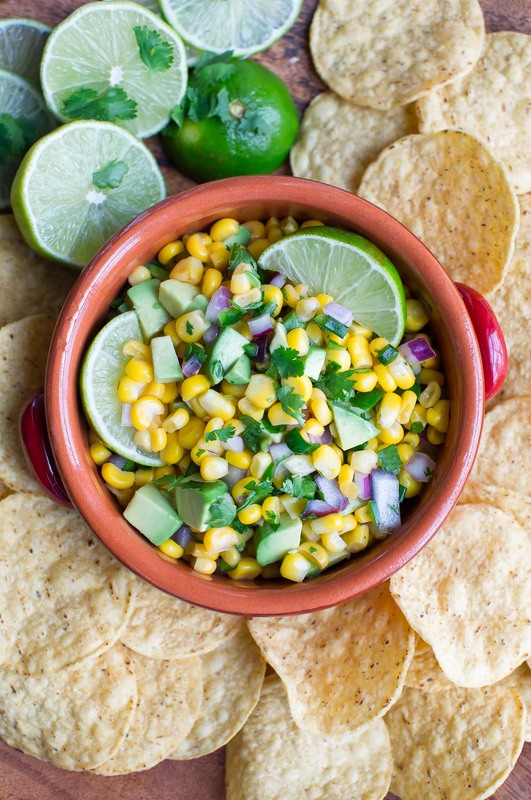 We love diving into a big bowl of this Avocado Corn Salsa with crunchy tortilla chips! Serve it up as a tasty appetizer or as a scrumptious side salad for Taco Night! This is totally one of those recipes that we make over and over again. As a food blogger I should totally be trying out different recipes each time, I know, but I can’t help myself around this easy peasy salsa. Whenever it’s on the menu my husband and I are downright giddy! It’s fast, flavorful, and a total crowd-pleaser. To make this bad boy a year-round affair, I employed a little help from frozen corn. You could also use fresh corn when it’s in season! This delish dish is vegan, vegetarian, gluten-free, and dairy-free. Get ready to toss it on everything like edible confetti – WOOT! Serving a large crowd and need a boatload of salsa? Go for it! Simply double, triple, or quadruple the recipe as needed! burrito bowls <– always a tasty option! three words: taco salad topping <– YES! You could also serve it over your favorite protein (I’m pretty sure it would take grilled chicken to the next level) and even try it as a savory stuffed sweet potato topping… which is totally happening in my kitchen next week! Enjoy! Rinse frozen corn in a colander to remove the icy coating. Heat a skillet to medium heat and add 1-2 TBSP avocado oil to the pan. Add your corn and sauté for 5-6 minutes or until cooked through. Remove from heat, transfer to a medium-large bowl, and pop it in the fridge to cool. 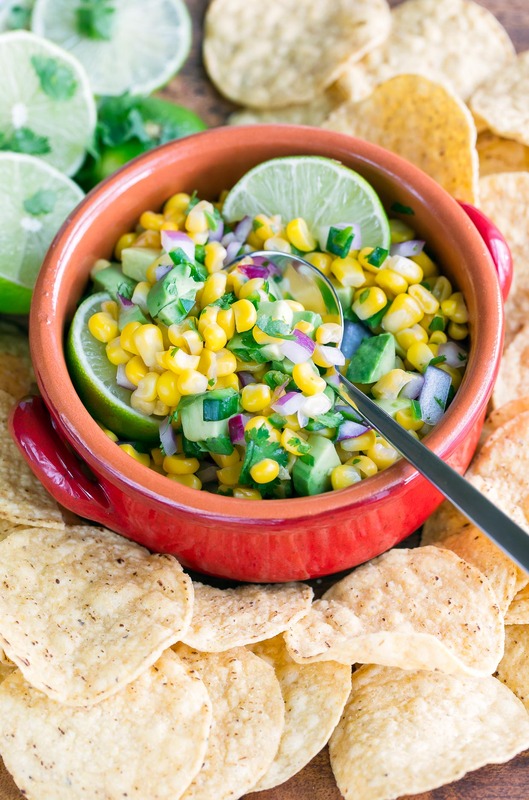 While the corn cools, chop your onion, jalapeño, cilantro, and green onion. Combine in a serving dish with with lime juice and a tablespoon of avocado oil then season with salt. Add chilled corn. Just before serving, slice avocados lengthwise and remove the skin and pit. Dice the avocado and gently fold it into the salsa. Serve with tortilla chips for dipping or on top of all your favorite Mexican and Tex-Mex dishes. It's great on everything! Feel free to add extra of your favorite veggies! Simply add a little extra lime juice and increase cilantro/salt to taste. Prefer to use fresh corn? Sweet! Simple grab 2 large ears of corn and remove the kernels. Sauté until tender and chill in the fridge until cooled. Easy peasy! 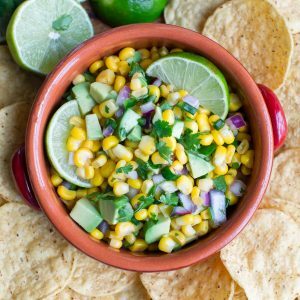 If you get a chance to try these tasty avocado corn salsa, let me know! Leave some love in the comment form below or tag your photos with @peasandcrayons on Instagram so I can happy dance over your creation! Hi. I’m panicky about an event for men next week. I can afford your recipes! Thanks. Um, YES PLEASE! Chipotle’s corn salsa is my favorite thing evvva and this is like an avocado-y version of that. (And we all know avocado makes everything better!) I Can’t wait to make this! Avocado is for sure the ultimate extra! 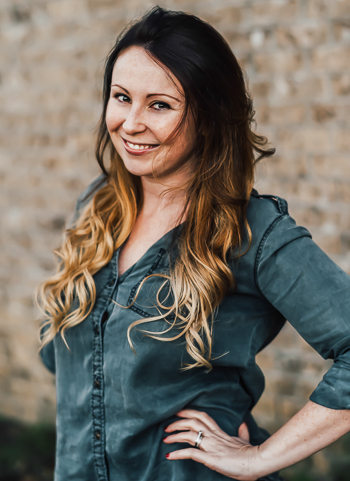 I’m so excited for you to try it!